Let’s talk about The Lord of The Rings. They are among my most favorites. A good number of battles have been shown in these movies. Why not discuss about some of them? What happened: King Theoden led his men to the fortress of Helm’s Deep to defend against Saruman’s army of Uruk-hai. The fortress being devoid of any moat or talus became vulnerable to the siege ladders. The deficiency of adequate battlement also made the defenders vulnerable to the crossbow fire of the Uruk-hai. These factors together with the numerical superiority of Uruks and their efficient siege weapons like ballista, battering rams or explosive mines robbed the Rohirrims almost any chance of victory. Moreover Helm’s deep did not have any supply route but the Uruks, being able to feed on human flesh, could easily forage their supply. So even if the Rohirrims could hold them off for a long time they would have suffered greater attrition eventually succumbing to defeat. Had it not been the reinforcements from Eomer and Gandalf the Rohirrims would have been overrun for sure. 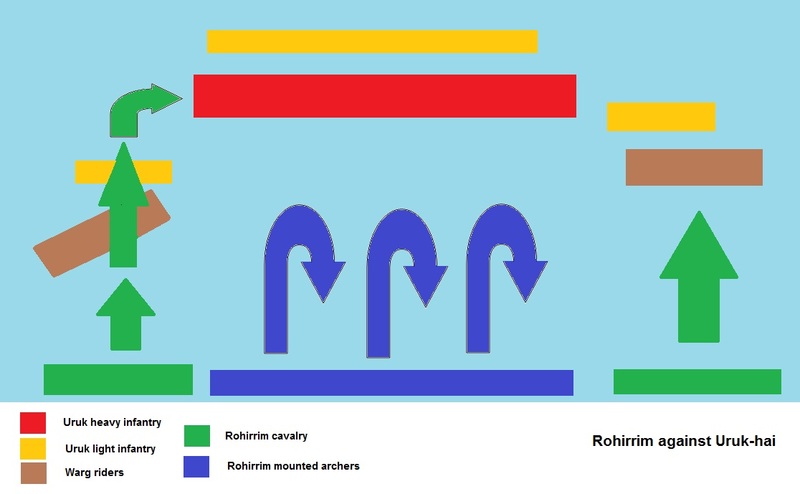 What could happen: The Rohirrims should have taken the advantage of their speed and agility by meeting their opponent in the open plains near Edorus. That would have left Rohirrims with the choice of superior maneuverability with which they could prevail over Uruks. The Uruk heavy infantry is quite invulnerable at the front due to their long spears, much like the sarissas of the phalangites of Alexander the Great. They also had light infantry of crossbowmen and cavalry of warg riders to protect their flanks. But the Rohirrims were doubtlessly superior horsemen and they could easily defeat Saruman’s cavalry and crossbowmen making their opponent’s flanks vulnerable. At this point Uruk spearmen would become helpless as they could not easily engage an enemy on its flank due to slow turning rate. Combined with this flanking maneuver the Rohirrim horse archers could shoot at Uruk heavy infantry formation without directly engaging them and then retreat as their opponent advances. Uruk spearmen could not chase them down and eventually their morale would deplete making their formation more vulnerable. Problems with such approach: Being in possession of a stronghold like Helm’s Deep it is very tempting to seek shelter in it rather than to meet the opponent in the open land. 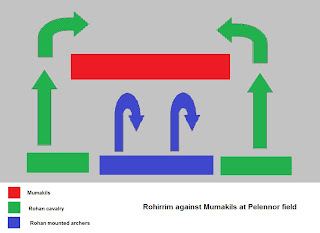 The maneuverability of the proposed tactics is largely dependent on the assumption that Rohirrim cavalry can beat Warg riders; otherwise all the tactics will be fruitless and the Rohirrim would have to fall back even if a rout does not occur. What happened: Rohirrim cavalry charged the Orc ranks and routed them. But when they faced Mumakil army of Sauron they charged them again and faced heavy casualties. Though they were not completely annihilated they failed to repel the Mumakils also before they received reinforcements of the Army of the Dead. What could happen: Rohirrims first charge was successful because they had strong morale and the Orcs were equipped with relatively smaller spears. But their second charge against Mumakils was not much effective. They should have used their mounted archers instead. Mumakils, though a larger target, were less vulnerable to missile weapons due to their thick hides. But their riders were more vulnerable due to their higher and exposed position and inadequate protection by the turret. So the Rohirrim mounted archers could harass them by hit and run tactics. That is they could give them volleys of massed arrow fire and then withdrawing to a safe distance to prepare for another volley. The Mumakils also had inadequate infantry support as the Orc army had been routed already. So their flanks were unprotected. Rohirrims could use this fact to their advantage by outflanking them instead of meeting them head on. That would allow the Rohirrim cavalry to encircle the Mumakils and injuring their hind legs with swords or wounding them mortally with spears or javelins. Problems with such approach: The Mumakils were considerably fearsome and an army unaccustomed to fight them could lose their morale. Moreover the Mumakils when injured grievously could rush to escape the battlefield crushing any troops nearby. That could also add to the casualty of the Rohirrims. What happened: The combined army of Gondor and Rohan got completely encircled by the numerically superior army of Mordor at the very start of battle and was at the threat of being annihilated had not the One Ring been destroyed in time. 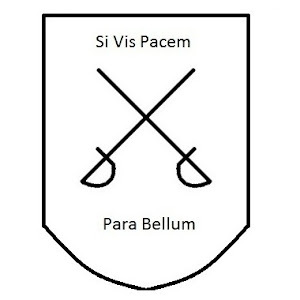 What could happen: The combined army of men should have anchored their flanks in the mountains on both sides of the Black Gate even if their line would have been considerably thinner. That would prevent the enemy from encircling them and that would have allowed them to hold off the army for longer. At least they would have the option to withdraw if they are overwhelmed. Problems with such approach: If their line gets too thin the enemy could exploit the weakness by achieving a breakthrough and then isolating portions of their army and thus defeating them in detail. Rohan had firce spear wielders than archers.With a population of 6000,a separate unit is pointless as they were no powerful infantry general to begin . It would have been better with a echleon assault formation for effective results .Since its like a wave,the enemies get pushed back causing a disturbance. As a matter of fact horses don't trample infantry lines unless severely injured. So if the enemy lines held their position their attack would have been costly and even futile, probably causing death of hundreds of cavalry.